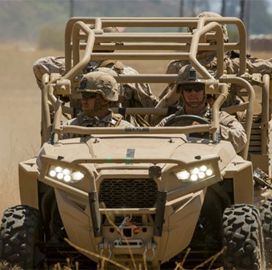 Jennifer Moore, a product manager at the U.S. Marine Corps program executive office for land systems, has said the service branch plans to issue a solicitation for new ultralight tactical vehicles by the fourth quarter of calendar year 2019, National Defense reported Tuesday. “Then we’re going to have a lengthy bid sample evaluation and assessment period of time, with our final [contract] award in early ‘22 and then immediate fielding thereafter,” Moore said Tuesday at the Tactical Wheeled Vehicles Conference in Monterey, Calif.
She noted that the service held an industry day in January and over 20 integrators, original equipment manufacturers and component suppliers took part in the event. A request for information released in November says USMC seeks a UTLV platform designed to carry out casualty evacuation and electronic warfare missions, offer logistical support and perform command-and-control operations, according to the report.